Crews at BIW are nearing the final stages of construction of the Zumwalt-class DDG-1000, which at 15,000 tons is the largest destroyer ever built for the Navy. 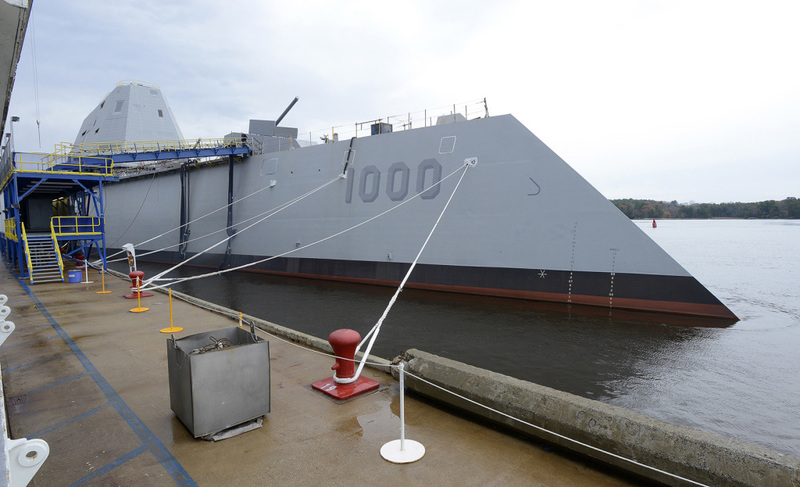 BATH –– The Navy’s top military officer called the USS Zumwalt “absolutely a technological marvel” and predicted the Bath Iron Works-built destroyer will influence the design of future Navy ships. “This is innovation and advanced technology and American know-how coming together,” Adm. Jonathan Greenert, the chief of naval operations for the U.S. Navy, said Wednesday morning after touring the Zumwalt with members of Maine’s congressional delegation. Crews at BIW are nearing the final stages of construction of the Zumwalt-class DDG-1000, which at 15,000 tons is the largest destroyer ever built for the Navy. 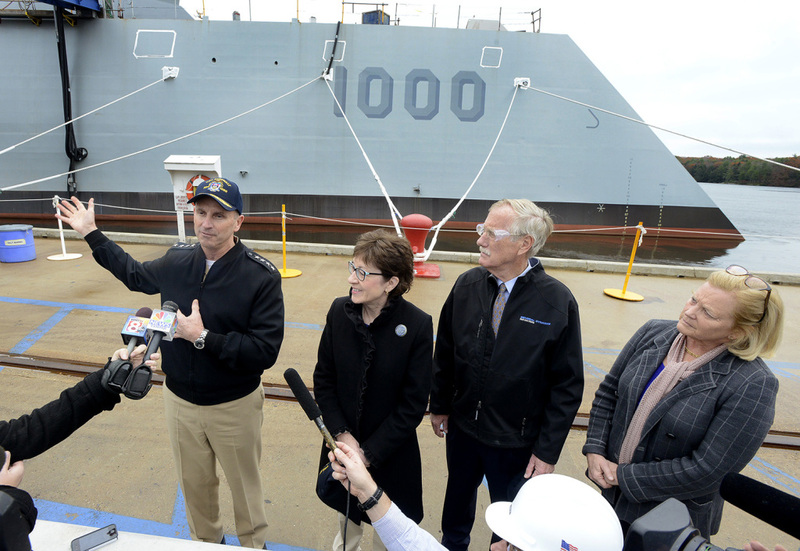 It is the first of three Zumwalt-class destroyers to be built at BIW and, at a cost of more than $3 billion, carries a host of technological advances never before incorporated into one warship. Despite its size, the Zumwalt is expected to look more like a small fishing vessel on radar screens due to its unique hull design and streamlined exterior. The ship is also expected to be able to hit speeds of up to 30 knots, can operate in shallower waters and has more precise weaponry than used on the Arleigh Burke destroyers also built at BIW. The Zumwalt is also the first destroyer to have a gas-turbine powerhouse capable of supplying power to the ship’s electric engines, weaponry and all other needs of the ship with room to spare – hence Greenert’s reference to the ship’s room for growth in the future. Greenert, who is a member of the Joint Chiefs of Staff, toured the ship with Maine Sens. Susan Collins and Angus King as well as Rep. Chellie Pingree, D-District 1. “This is the most advanced warship in the world, bar none. Period,” King said during a press conference after the private tour. The USS Zumwalt is expected undergo at-sea testing next spring or summer. While only three of the Zumwalt-class destroyers are expected to be built – down from the original plans for 30 – Greenert said the ships’ stealth design, quietness, electric propulsion system and smaller crew size will likely be incorporated into future ships.